Woohoo! You’re going to have a baby soon! Among the many things you’re thinking about (car seats, labor breathing techniques, how you really need to get those onesies washed) is the fact that you need to pack some stuff to take with you when you give birth. 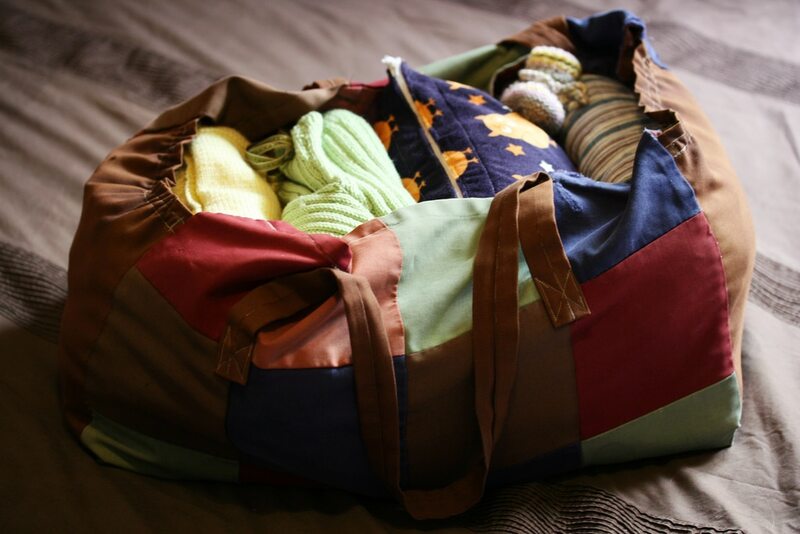 Some things are pretty obvious, like baby clothes and your phone charger, but there are a few other things you can pack to make sure your stay is pleasant. Like most doulas, I come armed with a bag full of labor tools such as heating packs and massagers, but here’s some suggestions of things you can bring for your labor and beyond. You can find any number of websites giving very exhaustive lists on what to pack in a hospital bag (I like this one, from Mama Natural) but here are the items I think are most essential, my five suggestions for items to bring with you to your baby’s birthplace, whether it’s a hospital or a birth center. 1. Hair ties: If you have long hair, do not leave the house to go give birth without a few spare hair ties. Chances are, you will want to get your hair up and off your face during labor and in the time after your baby is born, too. Get the thick ones that don’t break–if you have shorter hair, spring for a stretchy elastic hairband. 2. Pillows: Hospitals never have enough pillows. Ever. And the ones they do have are usually kinda flat. If you want, bring an older pillow with a pillow case you don’t care about, just in case you happen to get some bodily fluids on it. But bring one or two pillows for sure. They are so useful for making different positions comfortable during labor and well as for propping you and your baby up for breastfeeding later on. Plus, how much nicer is it to snooze on your own familiar pillow? Sooooo much nicer. 3. Easily digestible snacks: I always tell my clients to bring easy snacks like applesauce, bananas, Jello, fruit bars, etc. If the hospital or birth center where you are delivering has a policy where you can eat, you can enjoy these all through labor. If not, it’s nice to have some simple, soft snacks around once the baby is born. I also suggest coconut water. I know a lot of people hate the taste but it’s such an easy, healthy way to hydrate and replace electrolytes! 4. Socks or flip-flops: Your feet are going to get cold, so a nice thick pair of socks is great to have. Bonus if they have those grippy nubs on the bottom–most hospitals provide those kind of socks, but they are pretty thin and you might not feel comfortable walking around in them. A pair of flip-flops or easy sandals is also good to bring, since you can wear them around the halls or in your room without having to go bare foot. 5. Something to make you feel at home: This could be a favorite blanket, a wedding or engagement photo, a stuffed animal, a book, a tchotchke, anything. Whatever it is, it should give you safe, happy, feelings whenever you look at it. Even the loveliest hospital room is still a hospital room, so bringing something that makes the space feel cozy and a bit more like you will help set the tone for your labor, delivery and postpartum.